It took us three tries to find the Monolith Garden campsite in Kingman, AZ. There was no address, and the freecampsites.net map just showed a marker on the edge of a cliff. No details from past visitors as to how in the world to access it. First we drove to the end of a road with an electrical box and two guys in an old van. Probably not the place. Next we tried to get directly to the marker from the highway by driving up a steep road, through a BLM (Bureau of Land Management) gate, and over a VERY rutted road which led nowhere. We decided the marker must be at the bottom of the cliff, not the top, so we drove 1000 feet down the highway and found the campsite, clearly marked. 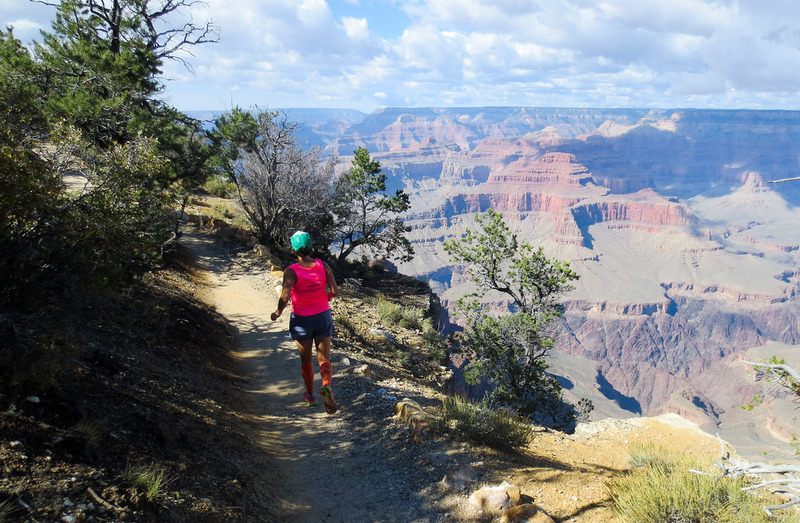 In the morning we went for a run on the trails, which wound between sandstone buttes (the “monoliths”) and traversed some cliffs with beautiful views of the stark landscape. Porter realized quickly that leaving the trail meant contending with endless cacti, but things got really bad when we ran down a trail with very sharp cacti balls all over the ground. They got on Porter’s nose and paws, in the soles of our shoes (they went all the way through mine to the skin), and most painfully in various parts of our bodies. I managed to pull a particularly large one out of my thigh only to have it stuck in my thumb. 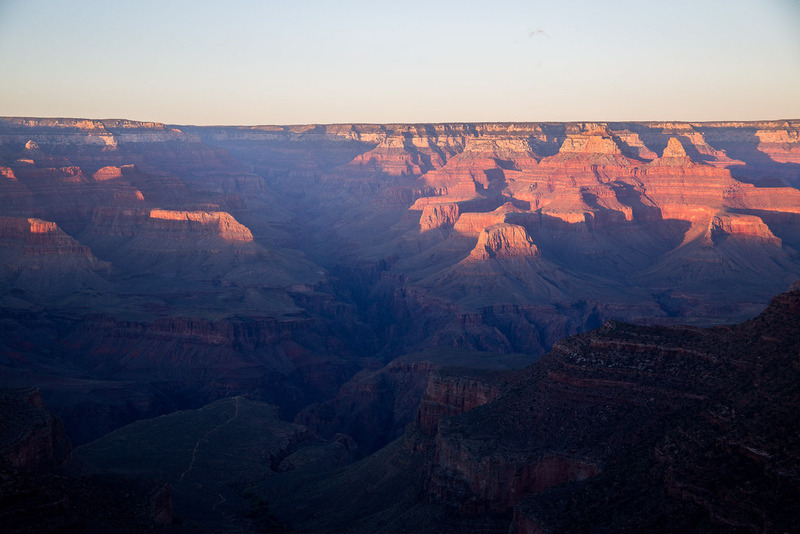 As we made our way back to the car, the late morning sun was relentless, with no shade in sight. Welcome to Arizona. 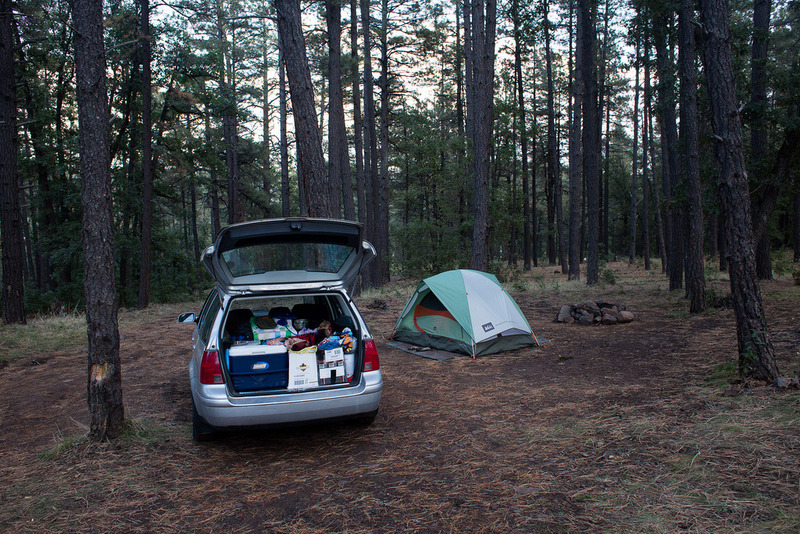 We drove on to Flagstaff, where we wandered around and planned our next move. 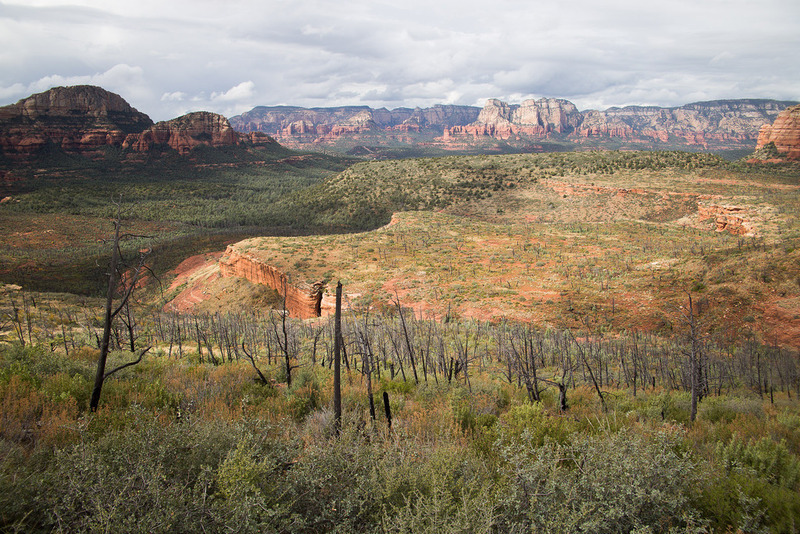 We decided to head down to Sedona, and found some primitive camping in Oak Creek Canyon. 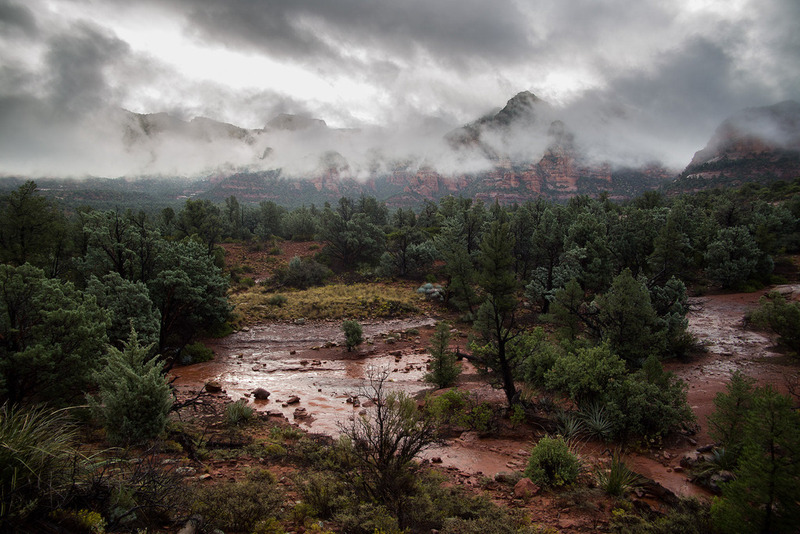 The weather around Sedona was fairly erratic; one minute the sky was bright and sunny, the next a torrential downpour would turn the roads and trails into red rivers. 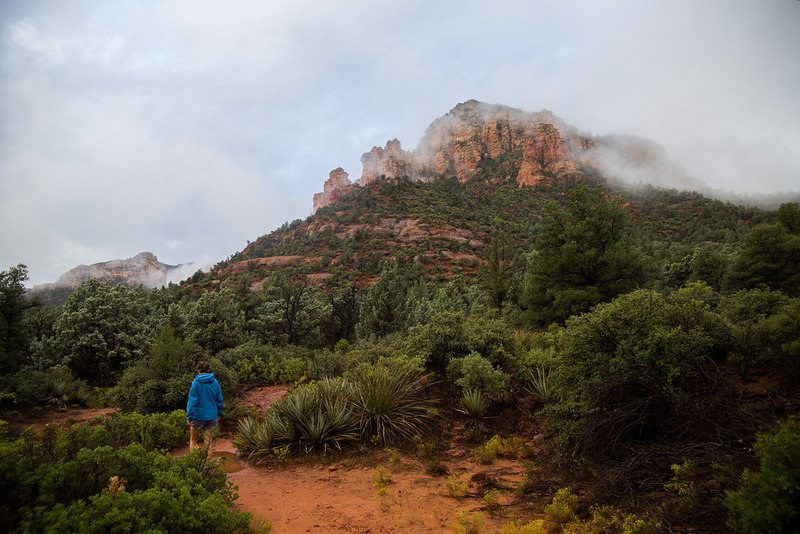 We made the most of it, taking time to check out touristy (and vortex/paranormal obsessed) Sedona, and taking short trips during clear skies to hike/run. 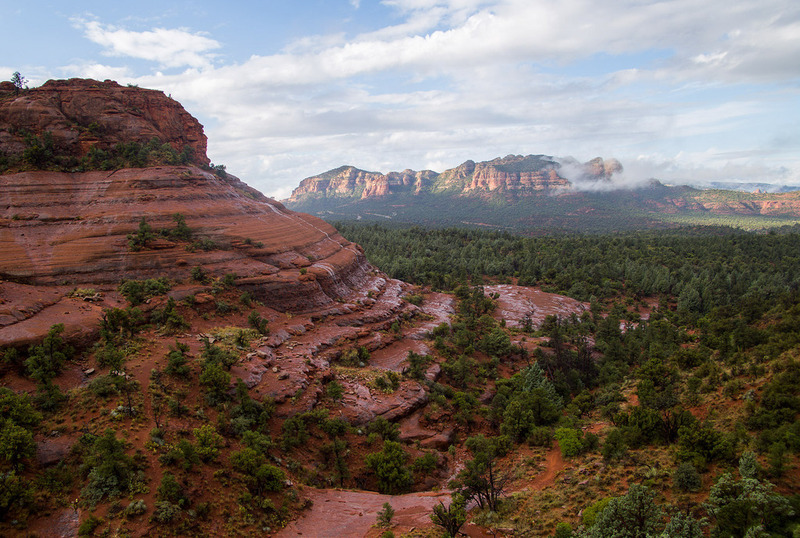 We stopped by the Sedona Running Company to learn more about the trails, and were told that after heavy rain a tall waterfall could be seen from Brins Mesa. 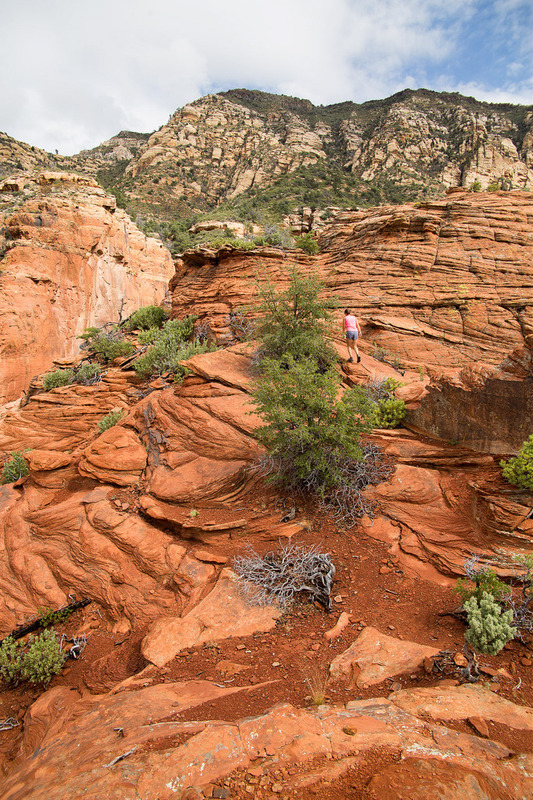 Unfortunately there wasn’t enough water for the waterfall to appear, but we were treated to magnificent vistas of red rocks and verdant green forests on one side of the ridge, and the remains of a 2006 wildfire on the other. 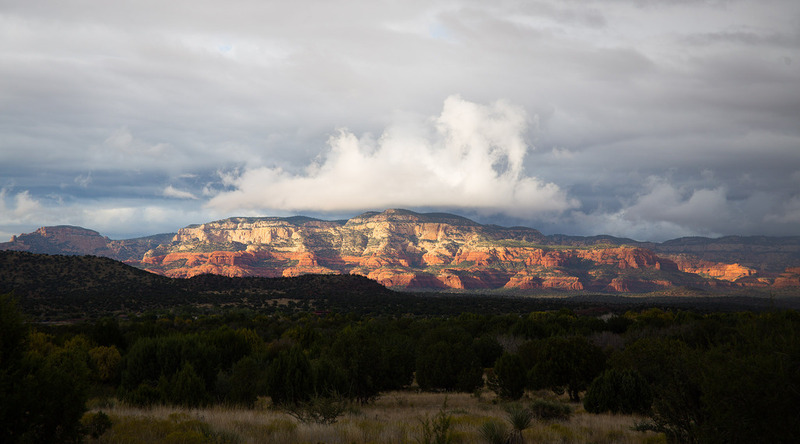 There wasn’t any free camping to speak of in Sedona (though we spent one night in the car boondocking at a trailhead), so on our last night we ventured out to the edge of town. 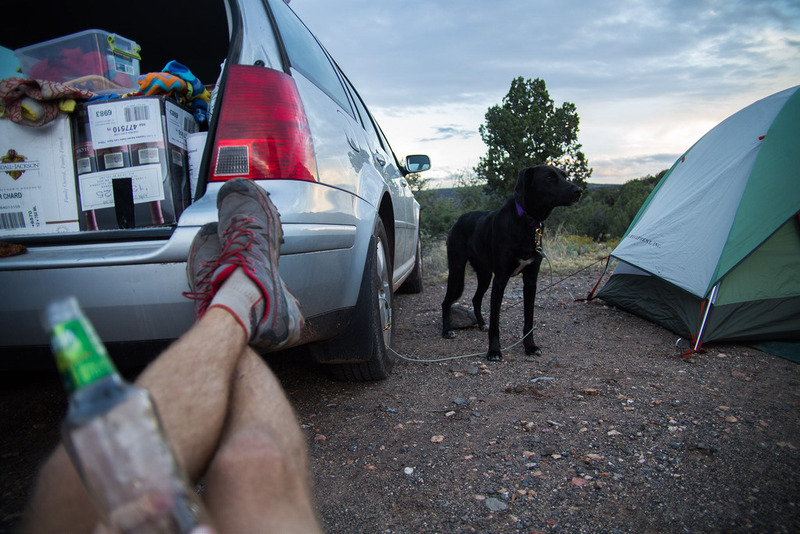 It was very humble primitive camping, just a few spots on the side of a gravel road, with no facilities. What we did have was a great view of the famous “Red Rocks”. Porter was keen on rooting through our neighbor’s campsite, so we had to take drastic measures. 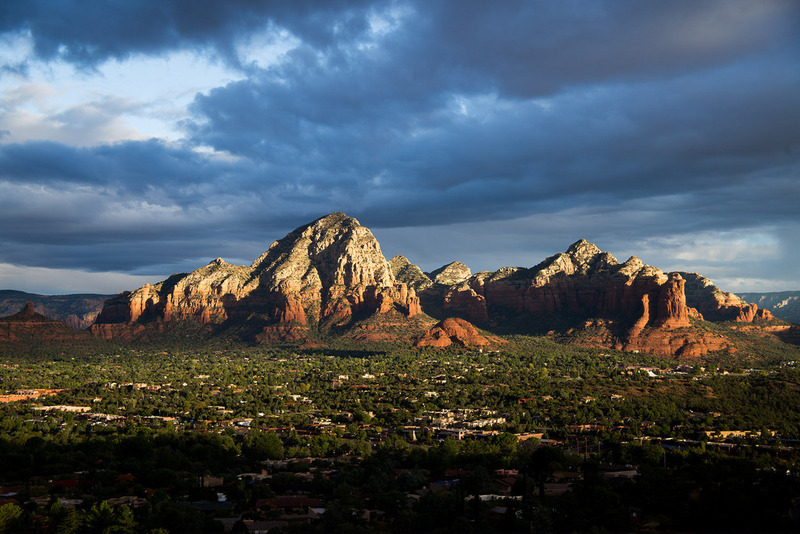 The “Sedona Airport Vortex” is a popular outlook for people to watch the sunrise/sunset, so we stopped by at dawn. I didn’t personally experience any kind of vortex effects, but I did get some nice photos. 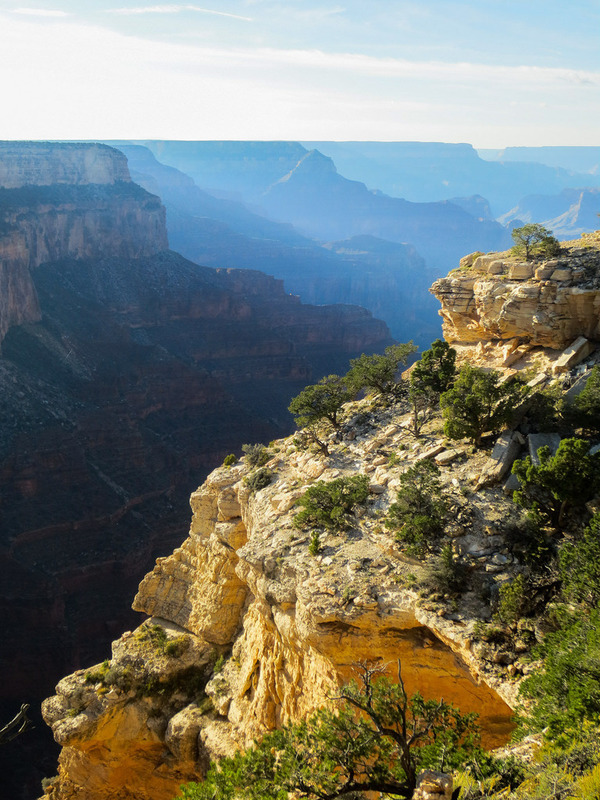 Of course, we had to make a stop at the Grand Canyon. 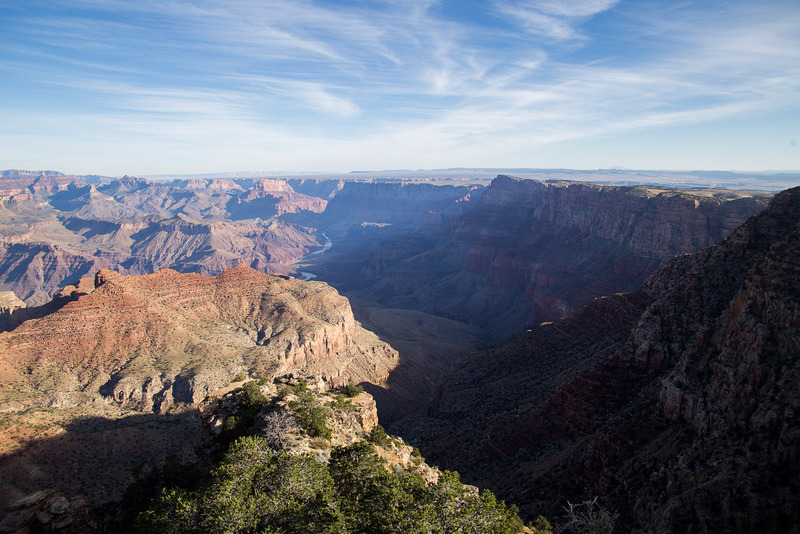 I’m not going to bother describing it, beyond that it is massive almost beyond comprehension. 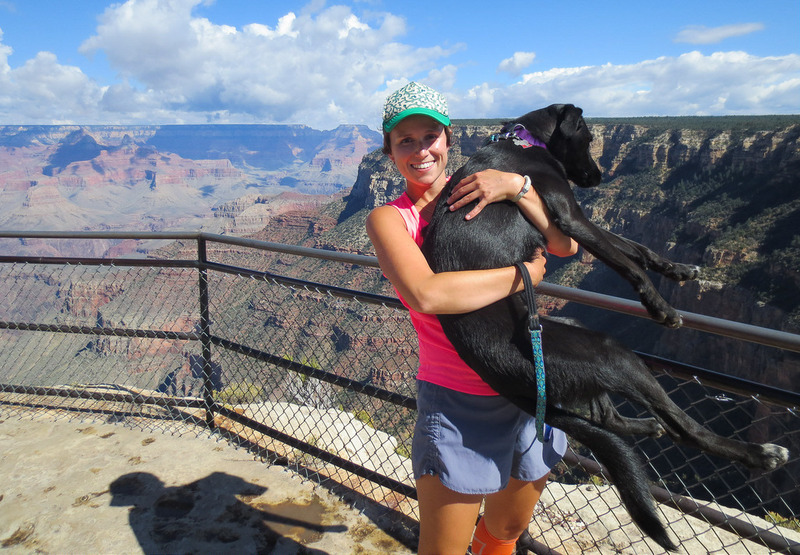 We couldn’t venture below the rim with Porter, so we opted to run along the rim to Hermit’s Rest. This ended up being a 13 mile out-and-back (sweaty and painful), but it was well worth of it for the almost constant incredible views. We finished right when the sun was going down, so we climbed down on a ridge and took it all in. The next morning we were off again, with one last glimpse of the Grand Canyon looking north. In the vast land beyond, Utah was waiting. Copyright © 2019 Fred Meissner. Powered by WordPress. Theme: Spacious by ThemeGrill.